The John Deere front and rear Mo-Co lineup includes five models with different configurations, depending on customer needs. After the successful introduction of the company’s first Triple-Mounted Mower-Conditioner in 2012, John Deere announces the addition of five new models that increase productivity of mowing and conditioning operations. The new Triple-Mount Mower Conditioners from Deere are designed for superior cutting and conditioning of crops in the field. Two front machines, F310R and F350R, have respective cutting widths of 3.1 and 3.5 meters. Either of the two fronts combined with two different configurations of rear machines (two 3.1 meters or two 3.5 meters) delivers three different configurations, R870R, R950R and R990R, with respective cutting widths of 8.7, 9.5 and 9.9 meters. 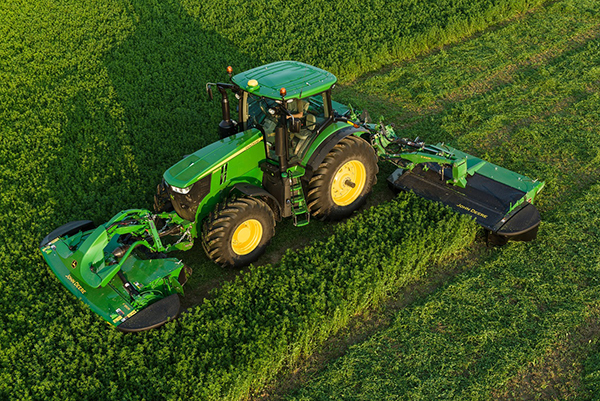 Productivity can be optimized further with AutoTrac™, the guidance system available on John Deere Tractors, which enables the new mower conditioners to cut and condition the crop at speeds up to 20 mph. Depending on tractor horsepower, transport speeds range up to 30 mph and transport widths can be configured to 3.5 meters or less. This helps operators reduce transport times and optimizes cutting and conditioning when working in each field. Maintenance time is reduced even further with a new front design that improves operator visibility when working. 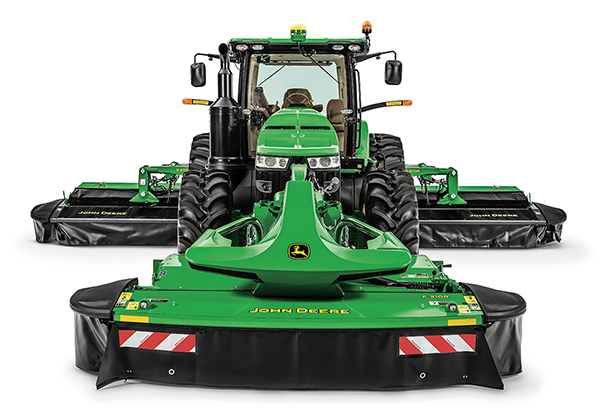 For more information on the new Triple-Mounted Mower-Conditioners and other hay and forage products from John Deere, see your local John Deere dealer or visit www.JohnDeere.com/Ag.